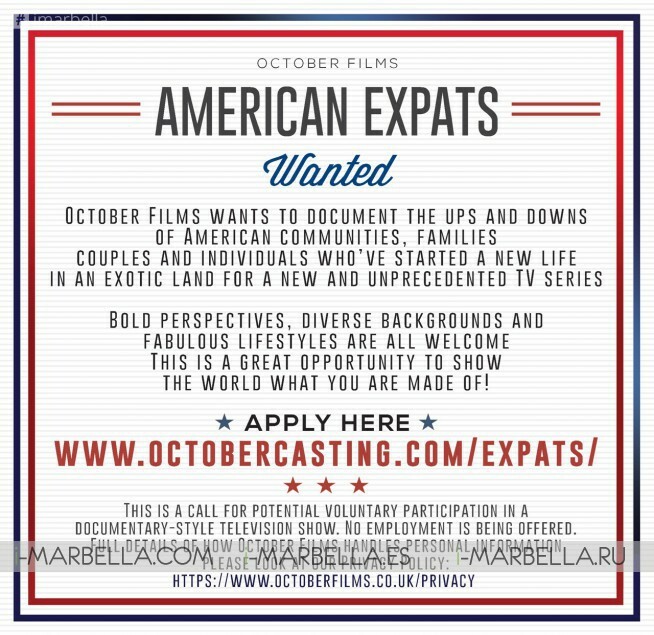 October Films latest development project aims to find US expats in southern Spain to create a new and unprecedented TV series. The British company is looking for English speaking American families, couples and/or individuals to document the ups and downs of a lifetime in Spain. The series will follow the selected people's lives in order to capture the beauty of the area, the excitement of the social scene and the joy of living and working in a faraway land as Spain. For this particular project, they are casting internationally in all countries with American language or trade. Once we find the favorite group we will then decide on the filming location. October Films is behind award-winning shows such as Walking the Nile, Dangerous Borders; Annie: Out of the Ashes, Outrageous Acts Of Science, Rude Tube, From Russia to Iran: Crossing the Wild Frontier, Mygrations, Jodie Marsh on Drugs, and Barbarians Rising; to name just a few. They produce a wide range of programming for both sides of the Atlantic including factual, high-quality history, current affairs, factual drama and of course entertainment programming for all the leading US and UK networks such as Discovery, BBC, TLC, National Geographic, MTV, Lifetime, BBC, Viceland and many more. October Films is an independent television production company based in London and New York. They produce high-quality, innovative programmes for broadcasters worldwide. One of the fastest-growing and truly independent production companies in the UK and US. They are experts in unique and powerful story-led content. From specialist factual, factual drama, hard-hitting current affairs and documentary to reality and entertainment, we aim high. Our work has earned us over 100 prestigious awards worldwide. Over the last five years, we have significantly expanded in the USA, Canada and across Europe, producing over 100 hours of content outside the UK market.